Cue the Music: Coming Soon! you are 2 of 5 people who know about this podcast that has yet to start up. i hope that you enjoy it, and more importantly, enjoy some of the music that i have grown to love over the past 24 years of my life. Even if you are not a fan of film music, i hope that maybe you will become more aware of film music. It is really funny, over the last 10 years i have gotten my friends into being more aware of film music. I am not trying to start a cult or anything, but i think that a lot of composers dont get enough recognition for their work. There are not a lot of film music podcasts out there. The only Film Music podcasts that i listen to are from Soundtrack.Net and Film Score Monthly's podcast. Those guys post podcasts every 2 months or so. I love film music so much that i wish and wish it was represented more. I am hoping that i become the premiere fan podcast for film music fans. Each week i will discuss the work of one composer and give any news that the Film Music comunity has to offer. I know that there is a limited amount of composers that i follow, but i will not cover entire careers in each episode. I will choose one specific Genre that each composer has dabbled in (ie-John Powell action scores) and work my way up to doing reviews of individual Album releases. My main goal for this podcast is to maybe get the opportunity to sit in on some scoring sessions and interview some of my favorite composers. those are pipedreams, but i really hope that the podcast becomes popular in the film music community. 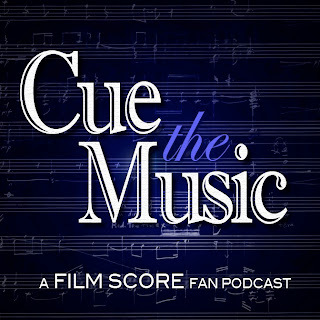 Thanks to all of you and look forward the "Cue the Music" film music podcast! Hey its your neighbor from downstairs! Can't wait for the John Barry episode, Dances With Wolves is my all time favorite Score. Hey man. i just may do a John Barry podcast next week. I think i want to start of with John Barry on a non-bond show, so i will have to look in my library and see what i have. chances are it will be a go! i do not have enough Barry (non bond) scores. i will see if i can get some more Barry music for next week.